NEW - Introducing our newest design, ExtendaShroom, is especially created for those of you with really green thumbs. Description: Solid copper body and stem. 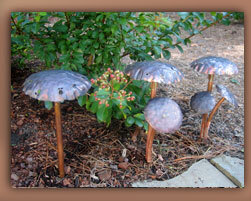 The PathShroom path light is the perfect landscaping enhancement. Description: We’ve crafted a great new version of our PathShroom series – so the “stem” of this light rises vertically from 14 to 20 inches, enough to peek above the new foliage and fresh blooms as your plants and shrubs mature thru the seasons. Description: Solid copper body and stem with small limb extension for greater light reflection. Description: Solid copper body and stem with 2 small limb extensions for greater light reflection. Description: Solid copper body and stem. Provide broad illumination for a flat horizontal surface, such as ponds, waterfalls, or landscape walls. Description: The WashShroom's unique design projects light onto plants, flowers, trees or landscape walls. Description: The WallShroom is specifically designed for installation into landscaping walls or timbers for perfect architectural accent lighting. Description: The WashShroom is specifically designed for installation into landscaping walls or timbers for perfect architectural accent lighting with an extra trouch. Description: This mini version of our path light series will beautifully brighten your container gardens, flower pot arrangements, window planter boxes or any other small space you want to enhance at night. Description: The PostShroom is designed for easy mounting directly to any fence post, deck railing, lattice work; or use for step lights to create a unique crescent shaped glow for lighting the way. Description: The GrillShroom provides great light to make sure you get the burgers and steaks just right. Description: "Ideas are welcome... let us know what your garden needs. Please contact us for details and pricing".